In honor of the great American hero and civil right’s activist, Martin Luther King, we have recorded an excerpt of his “I have a dream” speech delivered on August 28, 1963. This was a MLK day project by a couple of the founders of Mightyverse to work through what it’s like to have multiple recordings of a single phrase available for a language learner. 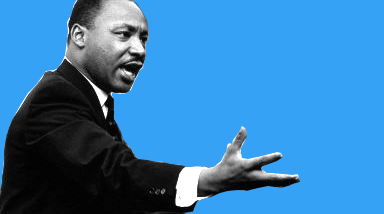 We recorded these MLK phrases by 9 speakers and they comprise the voices of this phraselist. With today’s inauguration, this project was especially meaningful. We hope that by providing translations of these phrases, people for whom English is a second language can appreciate this important and inspiring historical event. After learning the vocabulary from the I have a dream phrases, you can watch a video of the full speech, the excerpt of the speech in the phrase list begins at minute 12:20. Martin Luther King’s speeches are part of our American culture that we would like to share with people learning English or visiting America. What would be an analogous speech in Spanish, Mandarin or Farsi? If you would like to record phrases that are inspiring to you in your culture or language, let us know in the comments below or just email us. Please check out the MLK I have a Dream Spanish Phrase List. Many thanks to reviewers @abie, @randommood, @chipaca and @Jorge_MS. This entry was posted in History, Speeches on January 21, 2013 by sarah.